Born on 9 Aug 1965, Eric Kwek Hock Seng takes it upon himself to the symbol of national pride. He follows every national campaign with great support and interest. Raised in a predominantly Dialect/Mandarin speaking environment, English was a hard language to master for Eric; especially with his family thriving in a local Getai business. However, Eric wants to change all of that by adding English lyrics into Chinese songs albeit to strong objection from his family and friends. Undeterred, Eric Kwek sets on a musical journey that sees him through mostly lows and finally hits a high when he is at the ripe old age of 50. A spin-off film from a music video that went viral (more than 3 million views! ), the Mr Unbelievable movie shares how the music video come about. Many mistook the name of the film as one of the super-hero movies from Marvel or DC Comic, but it is just a simple story about a grass-root character who dreams about being famous. With zero expectation, the cheesy film touched me (surprisingly) at certain parts. Through different language mediums, the film used many flashbacks to the 80s to provide the audience with a backstory of how Eric Kwek becomes what he is now. With musical aspects and a very short humourous fight-scene, the film also gave a little insight to the post-getai era, as well as a hint of how competitions are often rigged to boost the fame of one of the contestants. There were many cringe-worthy moments, like how Man Li (Liu Ling Ling) tried to be gentle towards Eric Kwek (Chen Tian Wen), huge contrast from her usual loud characters. Of course, there are still some letdowns. With frequent flashbacks to the 80s, Eric Kwek’s look didn’t change nor look younger despite that being him in his 20s. Eric’s love interest Ah Hua (Jaime Teo) didn’t seem to age on the other hand. The poor planning on the make-up of the two different eras made this film as “unbelievable” as its name. 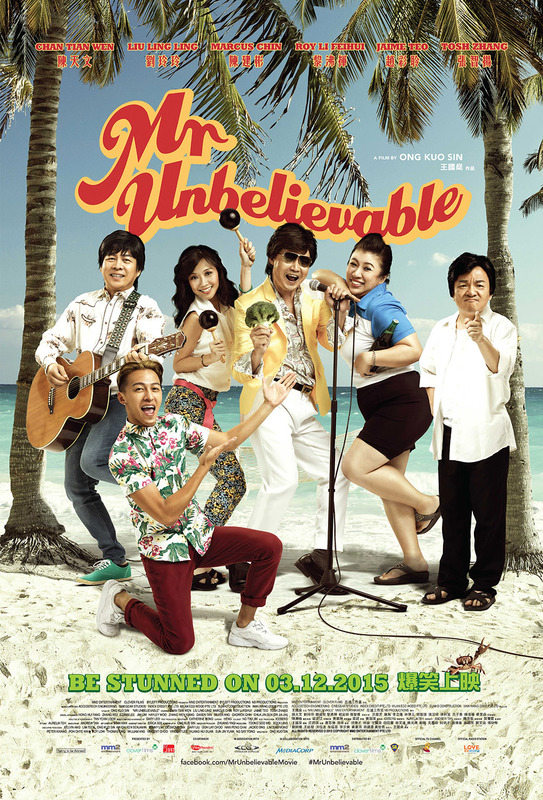 Try catching this film if you need some laughter during the weekdays, and if you are able to look beyond the corny plot, you might just be inspired by the sudden and ridiculous boom into fame of “Eric Kwek” (or Chen Tian Wen) when he’s in his 50s. Morale of the story, never stop trying! Mr Unbelievable, a movie spinoff of the viral music video, Unbelievable. This song was written to service a plot line in the latest season of “Spouse For House” where a main character Kai (Desmond Tan) has a unique speech pattern. The writers thought it would be really fun to justify how this “unnnnnnbelievable” speech pattern came about and cooked up an episode specially for it. He also engaged Eden Ang and Charlie Goh who starred in Tanglin to cameo in the film. Eden Ang, who is known for his breakdancing background and involvement in local Youtube Channel Wah! Bananas, was involved in the choreography of the action scenes in the film with Liu Ling Ling. The movie was filmed and completed in 15 days. Chen Tian Wen filmed from 7.30am till 8pm daily for 15 days. He became tanned after a full-day outdoor shoot at the beach. For the role, he started a diet and lost 10kg. Check out Mr Unbelievable Facebook Page! Mr Unbelievable is out in cinemas on 3 December 2015. *Disclosure: Invitation from Clover Films Singapore. No monetary compensation was received for the movie review. Mr. Unbelievable, Erik Kwek looks so interesting. His persona is already funny for me. I hope the movie does the real catch. This looks like such a cheesy movie. I don’t think I’ll be watching it. Haha. It sounds like a good movie when you just want to break free the hassles of life. Looks like a so so comedy movie. With that rating, I guess I would pass checking out this movie. Is he that famous like the artist who sang “gangnam style”. That must be something if your video has so many views online. No, he’s not. It’s just how catchy and old school the song was that made it went viral. It looks like a good movie coming from the Viral Video. The beach setting also feels refreshing. I think this movie is worth watching when you’re not too busy or just want to have some chill time. The musical aspects and the humorous fight scene is similar to regular films we have here in the Philippines. The movie costume and makeup director should not have overlooked on how the characters would look like on camera relative to the story. So it’s like a story behind the viral video? Quite interesting. A lot of people try to become famous by doing what he did. This is interesting. It’s a first for me – from a music video to a film as this usually isn’t the case. The music video must be something to get millions of people interested. I am curious as this looks like a fun film to watch. Actually the story like sounds adorable! Thanks for the review.